Berlin, GERMANY -- July 26, 2018 -- Luxoft Holding, Inc (NYSE: LXFT), a global IT service provider, today announced it was awarded ‘Most User-friendly HMI Feature’ for its User Centered Electric Vehicle-Infotainment (LUCEE) UI at the Car HMI Awards 2018. The Car HMI Awards are part of Europe’s leading HMI and UX event, which brings together hundreds of experts in HMI, usability and user experience. It recognizes exceptional projects in two categories: most innovative development process and most user-friendly HMI feature. 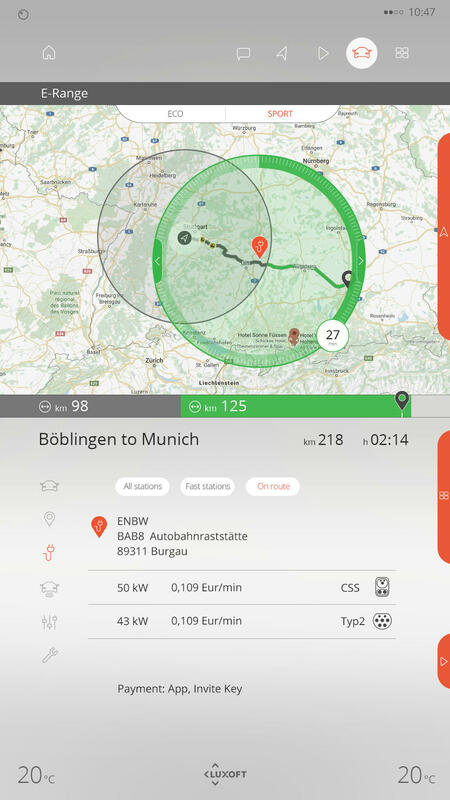 LUCEE was designed specifically to meet the everyday challenges of interacting with electric cars by making a smartphone the central point of control for the system. LUCEE allows users to drag and drop tasks and information to personalize their screens, just like a mobile phone. As an intelligent user interface designed for electric vehicles, LUCEE comes equipped with a self-learning AI personal assistant which recognizes your voice. The personal assistant can take requests on what amenities you would like available at a charging station, such as one with a nice restaurant. It also plans trips that take into account battery life and charging ports. Users then can see a dynamic visual of their entire trip on the screen, and can adjust their distance range and associated charge time with intuitive touch interactions. To learn more about Luxoft’s HMI developments, visit the website here. Luxoft has more than 12,900 staff across 42 cities in 21 countries within five continents, with its operating headquarters office in Zug, Switzerland. For more information, please visit www.luxoft.com.